This looks like a great read! I love it! This looks neat. I like your comment about mutual respect for reader and writer. I love this kind of book, even though I am the exact opposite of a country girl. I’m looking forward to reading it. I grew up on a farm, so I will have to buy this book! Well, following up on my goat cheese fantasy, and having lived on a farm half my life, this would appeal to me. I could even be convinced to raise chickens I think, along with my goats. I liked this book a lot when we read it for our online book club. I think you’re right – it’s not a super fast read, but it’s not meant to be one. It’s a book you settle in with and enjoy for awhile. 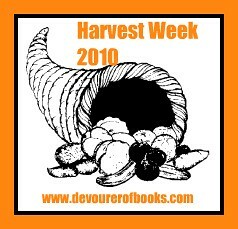 Also, I can’t wait to read all your Harvest Week reviews. I’ve read all the books you mentioned in your other post, so I’m excite to hear what you thought. My mom would love this – I might have to get it for her for Christmas.